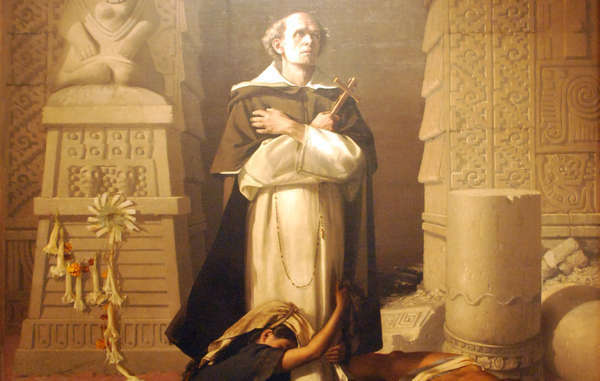 Bartolomé de las Casas, protector of Indians, was a 16th century Spanish missionary with a passion for social justice. An illustrated portrait of Spanish Dominican friar Bartolomé de las Casas, the author of &apos;A Short Account of the Destruction of the Indies&apos;, written in 1542 and published in 1552. After they had tied him to the stake but before they lit the fire, Hatuey, an Indian leader, was offered a spiritual reprieve by a Spanish priest. Would he like to ensure the certain passage of his soul to heaven by embracing Christianity? he was asked. Hatuey contemplated the proposal. ‘Are there people like you in heaven?’ he replied. When the priest reassured him that there were, Hatuey responded that he would prefer to go to hell, where he would not know such cruel men. Hatuey died 500 years ago, on the island of Cuba. The people he wanted, at all costs, to avoid – even at the risk of eternal damnation – were the Spanish conquistadors. 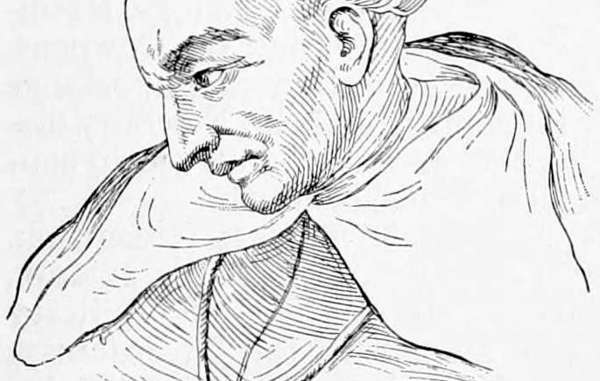 The Indian leader’s death was instrumental in shaping the seminal beliefs of one man: Bartolomé de las Casas. He was a slave owner-turned-Bishop-turned-chronicler who raged a life-long battle against the murderous injustices meted out to South American Indians by the colonists. As ‘protector of Indians’, de las Casas was one of the first missionaries to uphold the rights of the oppressed and protect the lives of indigenous peoples. 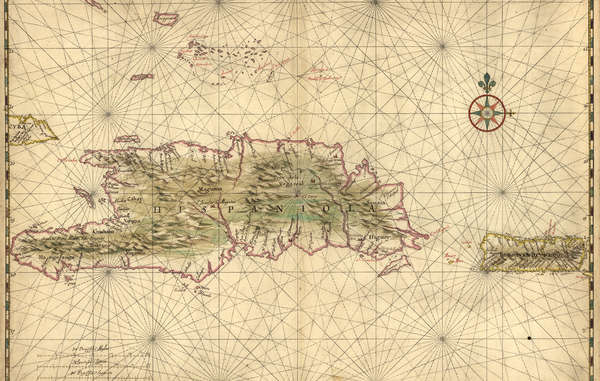 Nautical chart of Hispaniola and Puerto Rico by Joan Vinckeboons, c.1639. If the Indians were devoid of wickedness, the conquistadors made up for it. It is thought that when the conquistadors arrived in the Americas, there were 100 million inhabitants. 90% died on contact, many succumbing to diseases, to which they had no immunity, brought in by the Europeans. De las Casas also saw, with rare insight, the ulterior motive of many conquistadors. Though the Spanish carried the Requerimiento – a royal document that outlined Spain’s divinely ordained right to sovereignty – into every battle, de las Casas believed that spreading the word of God was largely a ruse: an expedient mask. Ambition, not altruism, was the driving force; gold, not God, was their goal. He believed that the conquistadors slashed and slaughtered their way like ‘ravening wild beasts’ across the ‘New World’ not solely in homage to Christ, but to ‘swell themselves with riches’. He suspected they had crossed the Atlantic not only to spread the word of the Lord, but to find the gold that washed through the rivers of Amazonia and the minerals that lay beneath their rampaging feet. ‘Our work,’ de las Casas said, ‘was to exasperate, ravage, kill, mangle and destroy.’ The conquistadors destroyed lives and lands, and they told the Indians that to save their souls, they would need to become Christians. 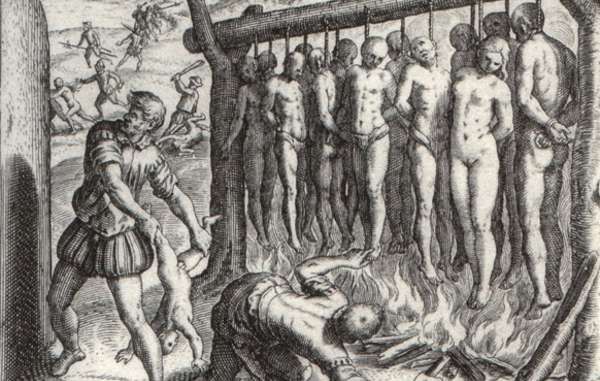 &apos;They made gallows just high enough for the feet to nearly touch the ground ... and they burned the Indians alive.&apos; Illustration by Theodor de Bry, published in 1552 in &apos;A Short Account of the Destruction of the Indies&apos;, written by Spanish Dominican friar Bartolomé de las Casas in 1542 . The systematic eradication of indigenous ways of life and beliefs is still used as one of the most potent weapons in the oppression of tribal peoples. Such is the religious zeal of some extreme evangelist groups today, that they still promulgate the line that people are condemned to hell unless they adopt Christianity. In extreme examples, contemporary missionary organisations such as the New Tribes Mission have even set out to force the first contact with tribal peoples, with devastating and destructive consequences. ‘Whether or not tribal peoples die in the process from alien illnesses seems to be relatively unimportant to some missionary groups when compared to securing heavenly eternity,’ says Stephen Corry. De las Casas reformed his views, giving up his Indian slaves around 1515, and set about exposing the lies. He felt morally bound to inform the Spanish court what was being carried out in the name of Christ. These truths, which became extensive writings about the mistreatment of the Indians – one of the most famous being A Short Account of The Destruction of the Indies – were instrumental in prompting King Charles V to issue his ‘New Laws’ in 1542, which abolished slavery and the encomienda system, and resulted in the liberation of thousands of slaves. 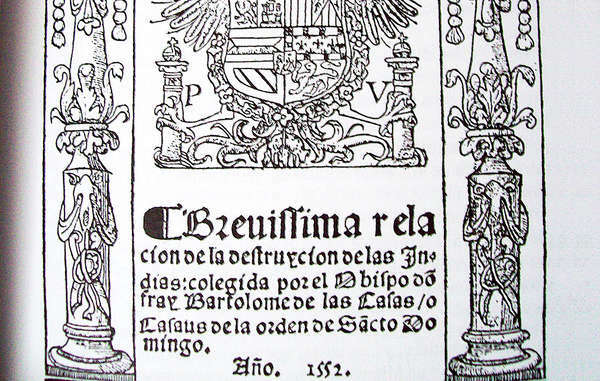 Title page of &apos;Brevísima relación de la destrucción de las Indias&apos; (A Short Account of the Destruction of the Indies), written in 1542 by Spanish Dominican friar Bartolomé de las Casas. Published in 1552. Today, de las Casas is thought of as an early human rights’ activist and considered by some as a father of liberation theology, a concept fostered as a movement in the early 1960s which believes that the Church should act to bring about social change. Such beliefs are often held, however, at great personal cost. De las Casas suffered the disapproval, anger and threats to his life of many of his contemporaries; many missionaries since him have been murdered for their humane principles. De las Casas was driven not by a self-regarding agenda but by a deeply-rooted sense of justice. ‘There are many others like them, who stand shoulder to shoulder with tribal peoples. But sometimes they pay the highest price for their compassion,’ says Stephen Corry. The man who sang the first mass held in the Americas was also one of the first to defend the lives and lands of the continent’s indigenous peoples. De las Casas knew the Indians were not inferior to their oppressors. He knew that ‘all the peoples of the world are men’ – rational human beings, part of a single common humanity. ‘For all people of these our Indies are human … and to none are they inferior,’ he said. ‘I shall do my endeavour, if God grant me life,’ he wrote. He was granted 92 years of life. Until his death in 1566 in a Madrid convent, he worked to end the racist oppression of South American Indians, and continued to decry the hypocrisy and cruelty of the conquistadors. &apos;The entire human race is one ... all human beings are born free and equal in dignity and rights.&apos; Bartolomé de las Casas. Painting by Felix Parra, 1875.